Ask any KICKR owner: you’ll pour some serious hours into your smart bike trainer. Since we know you need your KICKR to work efficiently every time you train, we punishingly put the KICKR to the grindstone in the engineering room. We obsess over making it simpler, more efficient, and more powerful in each iteration. This year we heard your needs and turned the cogs again. The KICKR, in response, is our most adaptable KICKR yet; this is the rider’s calling. Cyclists love new gear. If you haven’t heard, we’re rolling out a groundbreaking addition to the cycling market: the KICKR CLIMB. We’ve replaced your front wheel with a carbon steel attachment that simulates real world elevation. As you pedal on your smart trainer, you’ll tilt in real-time to the same grading changes that your route dictates. It changes the way we interact with Zwift and our bike trainers. It lifts your training with real burn and feel as you’ll have to stand up and adjust to the new angles. Your pain cave just got taken to new heights. Because of this new tech, we’ve built the CLIMB to work uniquely with the new KICKR and KICKR SNAP. Your new KICKR has all of the internal advancements required to easily pair up to the CLIMB. Prepare your weary legs for the next generation of uphill indoor training. For those riding on thru axle systems, we’ve made an another welcome upgrade to the KICKR: 12×142 and 12×148 thru axle systems compatibility! 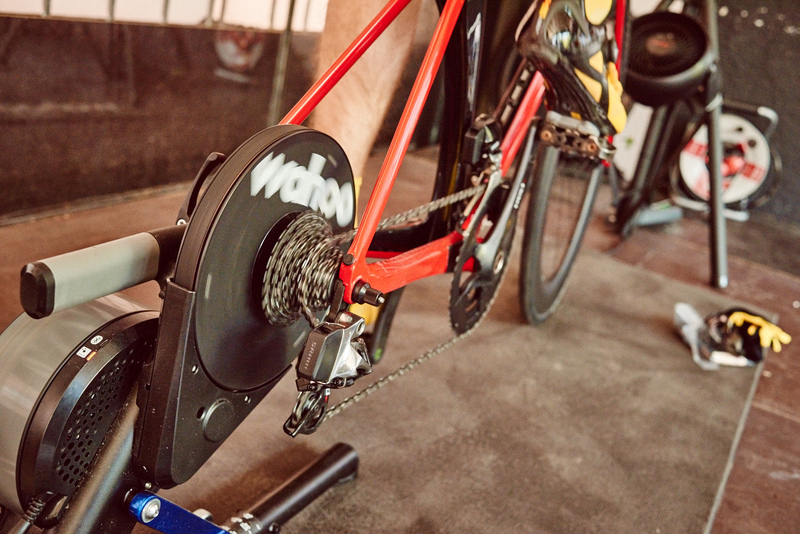 Your favorite bike can plug right into your indoor bike trainer without the need of an adapter. The newest edition of the KICKR is making it easier to get right into the fun. Our new KICKR has also been readjusted for your rugged disc brakes. We’ve expanded the KICKR system to fit more rotor sizes. As more and more bikes are using disc brakes, the chances that the next bike you use on the KICKR will have them is high. It’s time to get your hands on the KICKR. If you’re a new adopter to smart bike trainers, or looking to upgrade, you’ve picked the perfect time to check out the new KICKR. The creation of the KICKR CLIMB will change the way you train. We designed the CLIMB to work exclusively with the KICKR and KICKR SNAP. Now, you can experience real-time gradient changes on virtual routes and structured workouts from your favorite training apps like Zwift or TrainerRoad. We are only getting stock of the KICKR CLIMB in 2018.